This post has been a long time coming. Since before I started baking any kind of bread, I’ve wanted to make focaccia. 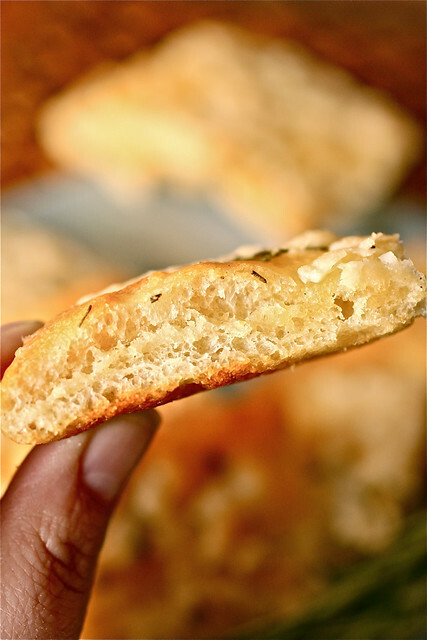 The puffy center and slightly crisp crust of freshly baked focaccia has always excited me. Yet it’s terrified me at the same time. How could what I make ever compare to the greatness of some focaccia I’ve eaten? Folks, that’s what learning to cook and bake is about. It’s about trying out new things, hoping they come out the way you want, and trying again if they don’t. Fortunately for me, this focaccia was everything I had hoped it would be. Since this Italian bread is as much of a blank canvas as pasta is, the possibilities for toppings (or even fillings!) are only as restricted as your imagination. I topped my first loaf with chopped rosemary and Asiago cheese and served it alongside spinach lasagna and a green salad. Nothing fancy, just good, homey Italian food for a Sunday night supper. The focaccia was beyond my expectations and half of the loaf was easily gone after a dinner with four people. Even after we had finished eating and were sitting at the table chatting before the dishes were cleared, we were still stealing pieces to munch on from the bread basket. The rosemary lends some really great flavor to the bread and the powerful Asiago is the perfect complement to the punch of the fresh rosemary. While from start to finish, this focaccia takes nearly 20 hours to make, almost all of the time is inactive, and the overnight starter is a key component to the final flavor, so don’t skip that step. You’ll be able to find plenty of things to do during the inactive starter/rise/proof time like sleep, make scones, hummus, toffee bar brownie torte, and spinach lasagna. Sunday was a very busy day for me in the kitchen but it was topped off with a very special accomplishment: my first focaccia. In a small bowl, mix the water and 1/16 teaspoon yeast, then add the flour, stirring till the flour is incorporated. The starter will be paste-like; it won’t form a ball. Cover with plastic wrap and let sit at room temperature for 14 hours. In the bowl of a stand mixer fitted with the paddle attachment, combine all of the dough ingredients, and mix on low speed just until the ingredients come together. Switch to the dough hook and knead the ingredients to make a soft, smooth dough. This should take about 7-8 minutes at second speed. Transfer the dough to a well-oiled medium bowl, cover with plastic wrap, and let rise in a warm, draft-free place for 1 hour. Gently deflate the dough, recover, and let rise for another hour. At the end of this time, the dough should have risen to double its original volume. Lightly grease an 18″ x 13″ baking sheet with a rim (or two 9″ x 13″ pans) with non-stick vegetable oil spray. Drizzle olive oil atop the spray; the spray keeps the bread from sticking, while the olive oil gives the bottom crust great crunch and flavor. If you’re using the baking sheet, gently pull and shape the dough into a rough rectangle, and pat it into the pan. As soon as it begins to fight you and shrink back, stop patting. If you’re using two 9″ x 13″ pans, divide the dough in half, shape each half into a rough rectangle, and pat one piece into each pan. When the pieces start to shrink back, stop patting. Wait 15 minutes; pat the dough farther towards the edges of the pan(s). Repeat once more, if necessary, till the dough is close to covering the bottom of the pan(s). Cover the pan, and allow the dough to rise till it’s very puffy, almost billowy. This will take about 1 1/2 to 2 1/2 hours. Toward the end of the rising time, preheat the oven to 425°F. Gently dimple the dough at irregular intervals with your fingers, pressing down firmly, but not abruptly; you don’t want to deflate it too much. Spritz heavily with warm water, and drizzle with 2 tablespoons olive oil (or enough to collect a bit in the dimples), then sprinkle with rosemary, black pepper, and the Kosher salt. Bake the focaccia for about 10 minutes. Reverse the pan(s) in the oven, sprinkle the Asiago over the focaccia, and bake until the focaccia is light golden brown, about another 10 minutes. Remove it from the oven, and immediately slide it out of the pan onto a rack to cool. Slice with a pizza cutter and serve at room temperature. Tara, this is simply gorgeous, and I bet it tastes divine! I made my first foccacia last week in a baking course I am taking and I was so impressed with its taste. I had been so intimidated to make it. Excellent job here! I bet the kitchen smelled like heaven. First time visitor to your lovely site and I could almost smell the focaccia. I love making focaccia and serving it in bite-sized pieces as a nibble with olives and griddled vegetables. Mine’s not usually as photogenic though! Ummm, yes please! Looks amazing. I love focaccia and I be this one tasted amazing! I love focaccia! I love how you can use whatever toppings you want too. The rosemary and asiago combo sounds awesome! This sounds fantastic. Can’t wait to try it! I just couldn’t pass up this recipe. I made it tonight to go with our salad and it was AMAZING! Really easy recipe it’s not fussy at all, just a little time and you have this amazing bread. I started the started and didn’t get to it for a extra day, and I didn’t have enough time to let it do it’s final proof in the pan. I helped it along a little with some warm rice packs, threw it in the oven and you would have never known. Thank you so much for sharing the recipe, I will be back to try many more I am sure!